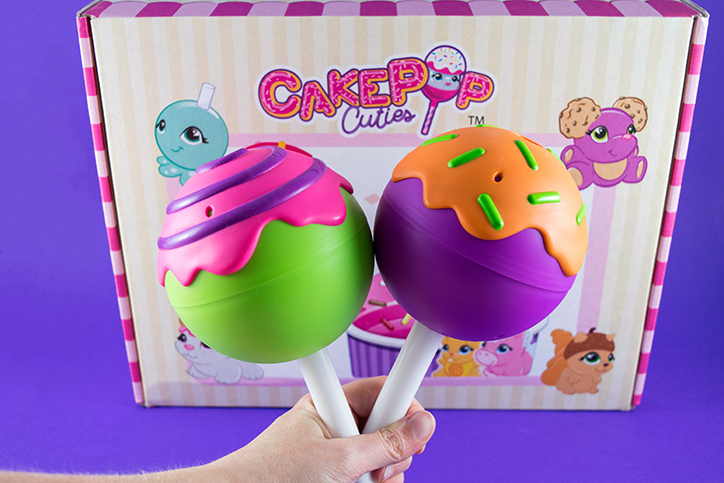 Enter the Delectable World of CakePop Cuties | YAYOMG! Note: We received a complimentary box of CakePop Cuties from Basic Fun! in exchange for a fair and honest review. No money was exchanged, and all opinions are our own; we were under no obligation to give a positive review. 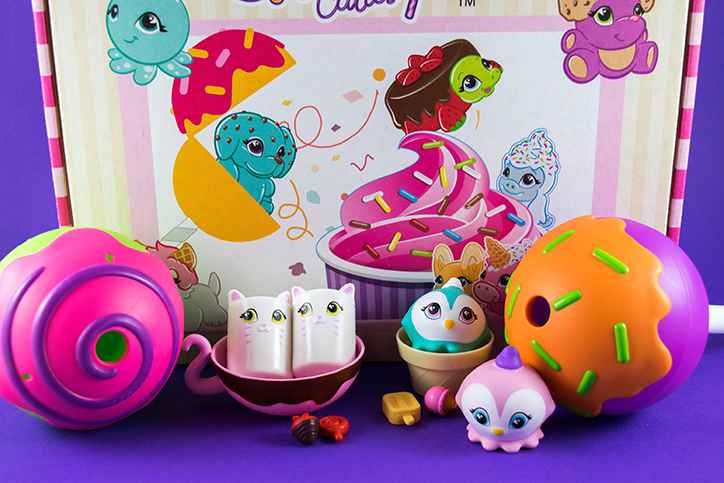 The CakePop Cuties are sweet, squishy, collectible creatures that live in a sugar lovers dream world. Everything in the world of CakePop Cuties is made from icing, dough, sprinkles, and all the other delicious makings of a tasty treat. They are born in flour beds that sprout rows of cake pops for as far as the eye can see, growing adorable Cuties inside for you to discover and love. 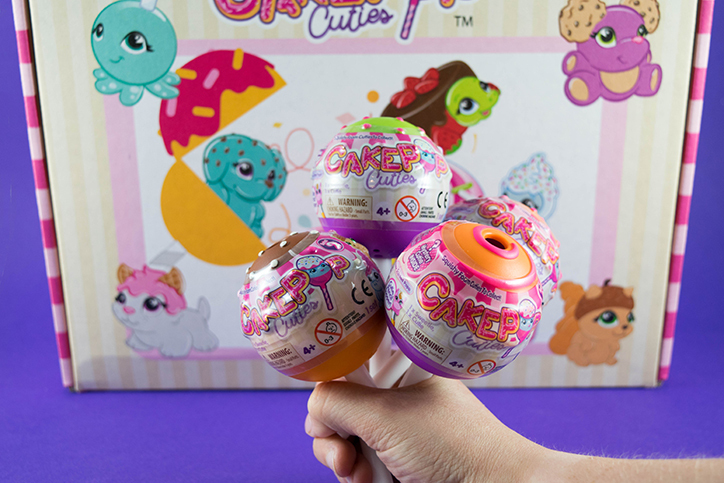 When you head to the store to pick out a CakePopCutie, you’re not just getting a new toy, you’re adopting an extra special new friend who’ll bring sweetness into your life in the form of an adorable squishy treat. Our friends at Basic Fun! sent over some new Cuties for us to check out, and we couldn’t be more excited. Here’s what you need to know about all the new CakePop Cuties that just hit stores. 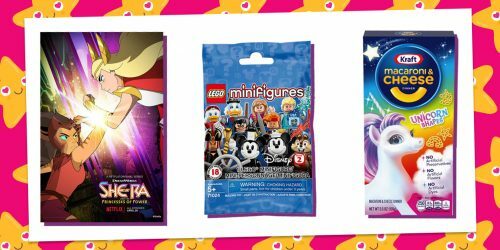 The Jumbo Pops are new additions to the toy store shelves, and they’re the biggest surprise yet! They’re twice the size and twice as cute as the regular CakePop Cuties, boasting even more surprises inside. Plus, they’re deliciously scented, making them even sweeter than before. We love how the extra large Cake Pops look even more delicious than the originals. They also really stand out on display on our toy shelf. Our Jumbo Pops each came with a Jumbo sized Cake Pop, two Cuties, and three accessories. Each Cutie is super soft and has extremely satisfying squishability and slow rising action! As always, each Cutie doubles as a pencil topper, making them great for stashing in your backpack to accessorize and bring you luck on even the hardest school day. As you can see, Marsha and Mello are cat marshmallows, and they come inside a mug of hot chocolate. We also got Annie and Artie, two ice cream inspired penguins. We love the way the Cuties and their accessories tie together so well! 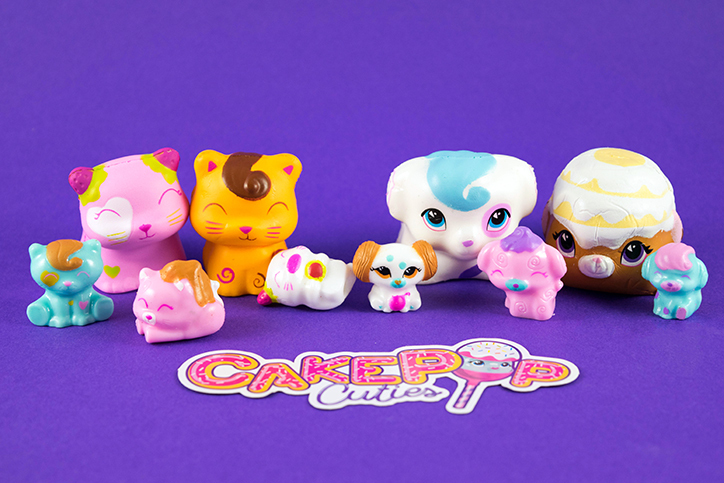 The original CakePop Cuties just launched Series 2, and they’re sweeter than ever. 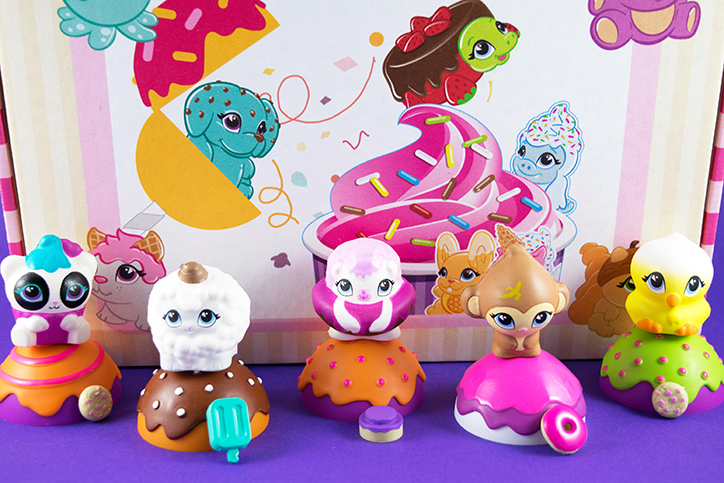 The Cuties in Series 2 are scented and come with a tiny dessert accessory, like cookies, cakes, and popsicles. Peel back the plastic and pop them open to see what’s inside. The first thing you’ll notice is their delectable smell, followed by a whole lot of fun. Whether you love to play and trade with your friends or just collect and display them, one thing is for sure! The Series 2 CakePop Cuties are even cuter than the first. 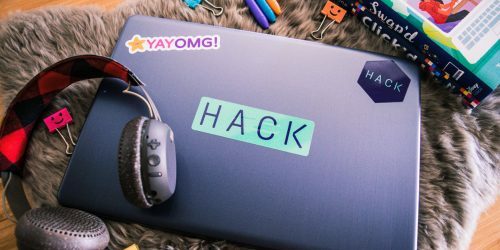 We can’t wait to see what they come up with next! 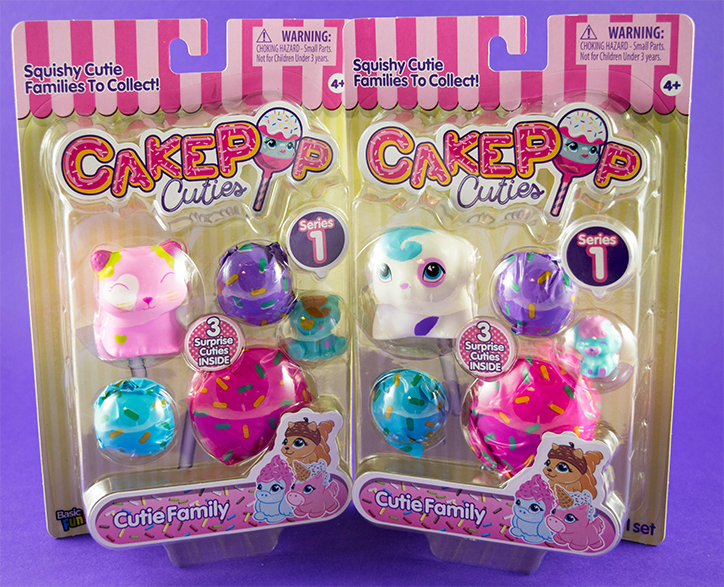 Also newly released is the first series of CakePop Cuties Families. These are multipacks with clear fronts that include five adorably squishy Cuties, two parents, and three babies. Since the packaging is clear, you’ll be able to see one parent and one baby, letting you know if you’ll be getting the kitty family or the puppy family. You’ll also receive three surprise Cuties, which include one more parent and two more baby Cuties. We were lucky enough to receive both the Kitty and the Puppy family, so we have the complete set. You can see them all above! We’re particularly obsessed with the kitty parents Strawberry Shortcat and Carameow, the parents from the kitty family. They’re just SO cute! The parents are normal sized Cuties, and the babies are smaller and more rubbery, but still squishy in their own way and they do fit on top of a pencil. Ready to bring home some of your own? CakePop Cuties can be found at Amazon, Walmart, and Target and range in price from $4.99-$9.99. Love squishies? Here’s how you can create some adorable squishy keychains to accessorize with!